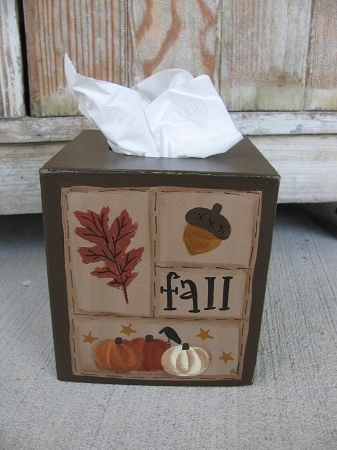 Primitive Autumn Fall Sampler Tissue Box Cover. This is my signature design of what I call, Sampler Quilt design pattern on tissue boxes. 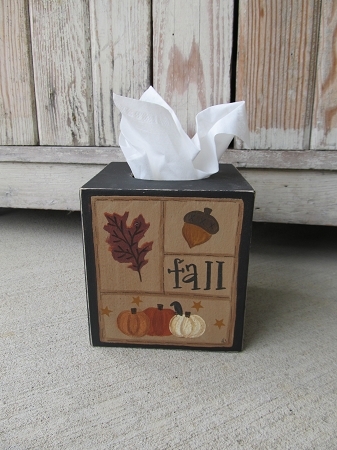 What a pretty way to disguise those tissue boxes. Color options for side colors, shown in black. Hand painted design on a paper mache cover. Painting has an acorn, oak leaf, group of three pumpkins with small crow and stars and the saying is Fall. Size is 5 1/2" x 5 1/2". Fits boutique styles boxes.